I have come back from seeing the animated family movie “The Boss Baby” from DreamWorks Animation. Much as it is important for a businessman to write a good memo, it is important for a critic to write a good review. A funny quote from the movie involves the main character saying “cookies are for closers” with a straight face. After this review is finished I hope to celebrate another successful critique by eating some cookies myself as well as indulging in the mixing of chocolate with milk. For if my review is written we enough I will have convinced you that “The Boss Baby” is a very…alright, to be honest, I’m not sure what this is. Is it a good movie? Not really. Is it bad? Um…I’m not willing to go that far either. For what I observed was a movie that was colorful and fun, with a unique premise that may not have been as ambitious in its execution as it was in its concept. That seems to be a reoccurring issue with DreamWorks Animation in general, and hopefully they can finally work on these performance problems now that they have new owners. 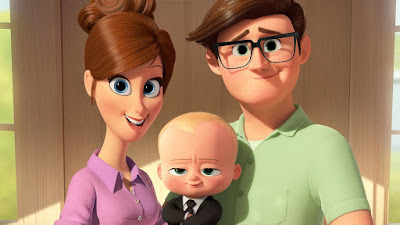 The idea to make Alec Baldwin the voice of a businessman in diapers is a good one and is likely the main catalyst to the movie turning out the way it does. For the directors milk the most out of Baldwin’s smug, arrogant charm. For the title character is indeed very charming, mostly funny, and has a lot of personality. It is one of those rare casting choices that hits the audience perfectly, much in the same way Eddie Murphy struck gold with Donkey and Jack Black did with Po. It is strange, then, that most of the jokes involving him revolve around his bare baby bottom than his rhetoric. 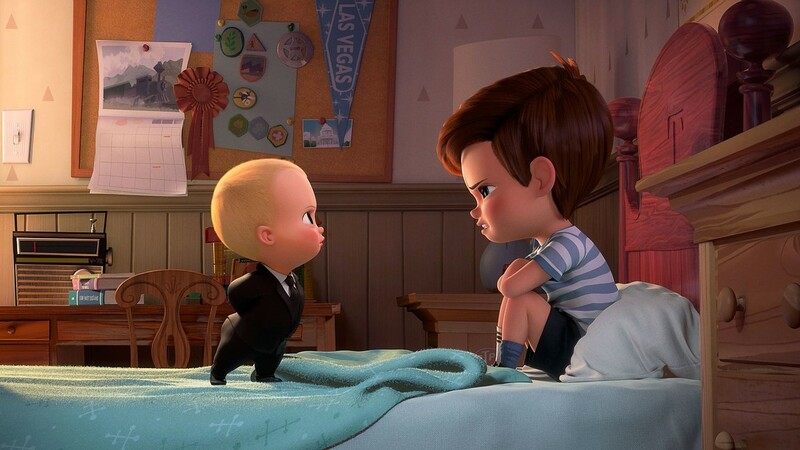 The storyline itself revolves around the Boss Baby needing to put a stop to a new breed of puppy that will never age. If the puppies actually make it to market, it will decrease the demand of babies, which has been in sharp decline for many years as is (heck, even my mom got a yorkie years after not liking dogs in general, so this seems like a valid fear). The person who might put a stop to him is his older brother Tim, who finds the presence of this new baby to be a problem (as well as suspicious since he was delivered by a taxi and not a doctor). He is more than willing to help him achieve this goal if it will get him the promotion he desires and out of the house. In fact, the movie is never able to really confirm if any of this is actually happening the way we are being told. Tim has a very active imagination which results in several dream sequences that are colorful and visually riveting. It even looks like some hand drawn animation was employed to make these sequences, which is a nice change of pace from the constant CGI this company bombards us with, and I’m hoping the sporadic uses of the technique will eventually result in a return to the art form that has long been forgotten. The question must be addressed though: does any of this make “The Boss Baby” a movie that is worth seeing when “Beauty & the Beast” is still playing theaters? Because contrary to my two star review, I did not hate that movie, and certainly see some enjoyment to be had. But that movie can be rented at home in a much better version and for a fraction of the cost. 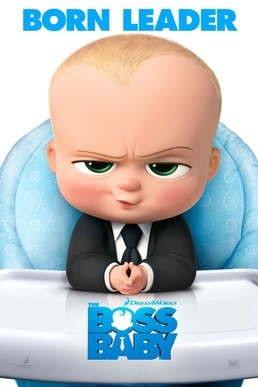 “The Boss Baby” is original if nothing else. It has lots of nice colors and (unlike “Storks” from last year) knows to slow the action down from time to time. Yet the movie never achieves brilliance. It comes on the screen with an aggressive premise and then wastes lots of time with visual jokes involving bare baby bottoms. From a business perspective, this seems like a B-movie you spend about $30 million on, yet DreamWorks have sunk almost $200 million into it. That is a business decision the Boss Baby himself might be insulted by. Given the choice between the two, “The Boss Baby” is going to offer you something new to see at least, but “Beauty & the Beast” is probably more enjoyable despite the fact it’s essentially an expensive rerun. Now, with that said, I successfully close another review. I now must go for there are Oreo’s waiting. Parents, the offensive parts of the movie all involve bare baby bottoms. Some people may be offended by such images, but I think most are at the point where this is a non-issue. Recommended for ages 6 and up.